From US Embassy Baghdad: Governor Schwarzenegger Visits U.S. Embassy Baghdad. On November 17, California Governor Arnold Schwarzenegger visited U.S. military and civilian personnel in Iraq to thank them for their service to the United States of America. 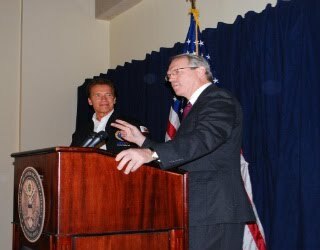 Hearkening to his role in the Terminator movies, the Governor kept his promise, made in 2003 when he first visited the troops in Iraq, telling them “I’ll be back“. Two other photos available here, only one enlargeable, the other, the governator’s thumbprint size, so don’t bother printing it out. The Multi-National Force Iraq has another photo here available in Flickr in five sizes. The Senate Foreign Relations Committee cleared the following nominations yesterday (reported on November 17, 2009 by Mr. Kerry without printed report). These nominations now go to the Senate for a full vote. Energy, and Business Affairs), vice Daniel S.
Issues, with the rank of Ambassador. three years, vice Miguel R. San Juan. Development, vice Kenneth L. Peel. See the video of the confirmation hearings and read the prepared testimonies submitted to the committee here. and Shareen Ketchem after the awards ceremony. U.S. Department of State Photo. DS Special Agent Fred Ketchem was named the Department of State’s Bureau of Diplomatic Security 2008 Employee of the Year. 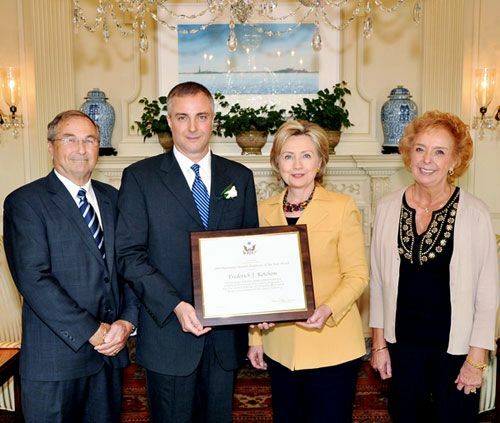 At a November 5 ceremony at the Harry S Truman Building, Under Secretary for Political Affairs William J. Burns presented Ketchem with a certificate signed by Secretary of State Hillary Clinton. He also received a monetary award of $10,000. The award was given to Ketchem for his superior achievements as senior deputy regional security officer during his tour of duty at the U.S. Embassy in Baghdad. From March 2008 to January 2009, Ketchem helped manage all security programs and investigations on behalf of the U.S. Department of State in Baghdad — site of the largest U.S. Embassy in the world. Ketchem supervised a security staff of nearly 3,500 employees — including more than 80 Diplomatic Security Special Agents — and oversaw a budget of almost one billion dollars. According to the State Department, Ketchem showed tremendous leadership and courage under fire in a war zone beset by more than 26,000 attacks during his tenure. In fact, soon after his arrival, the new U.S. Embassy in Baghdad experienced its most intense period of sustained rocket attacks to date. Ketchem and members of the RSO Baghdad team also received the Department of State’s 2008 Award for Heroism for selfless actions under heavy fire. Ketchem is currently the Special Agent in Charge of Secretary Clinton’s protective detail.